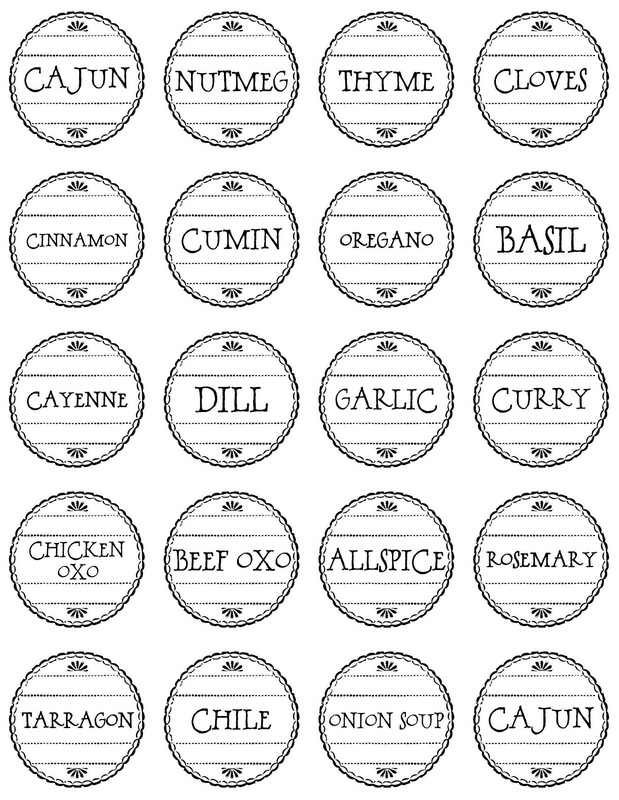 I made some labels for my newly-organised spice jars. I am so happy with how they turned out! They don't quite cover the permanent marker I had used on the lids, but it's good enough for me! 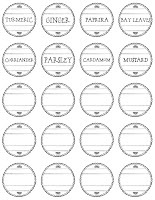 I made the lables using this "vintage round lables" printable as a starting point. This is my super-attractive solution to elevate the back row. Two beat-up 2x4s. But as you can see, it works perfectly! The rack is from Zellers. If you like my lables, you can print some for yourself! Edited to add: The jars are from Ikea! Sorry for leaving that out! I put it in my previous posts about this spice cupboard, but totally forgot to include it here. Here in Canada, the jars are a set of 4 for $3.99. 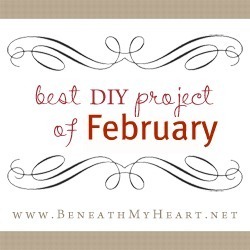 And special thanks to Traci of Beneath My Heart for featuring this post in her best DIY projects for the month of February! VERY cute!! if i had room in my tiny pantry for a spice rack like that i'd totally copy you. :o) i have an ugly rack on the back of the pantry door...maybe you've inspired me to get a little fancy! I don't have room in my pantry either ;-) My spices are in the upper cupboard next to the stove. PS, you could wrap those "super-attractive" boards with some brown paper, or newsprint, or something and they might look quite quaint. Great ideas, Deb! I do have plenty of brown kraft paper ;-) Or even some wrapping paper. Love it!! I saved the photo to look back at when I do some spring cleaning. Love them!! They are so cute! You spice cupboard looks wonderful! Oh my goodness, this is adorable! 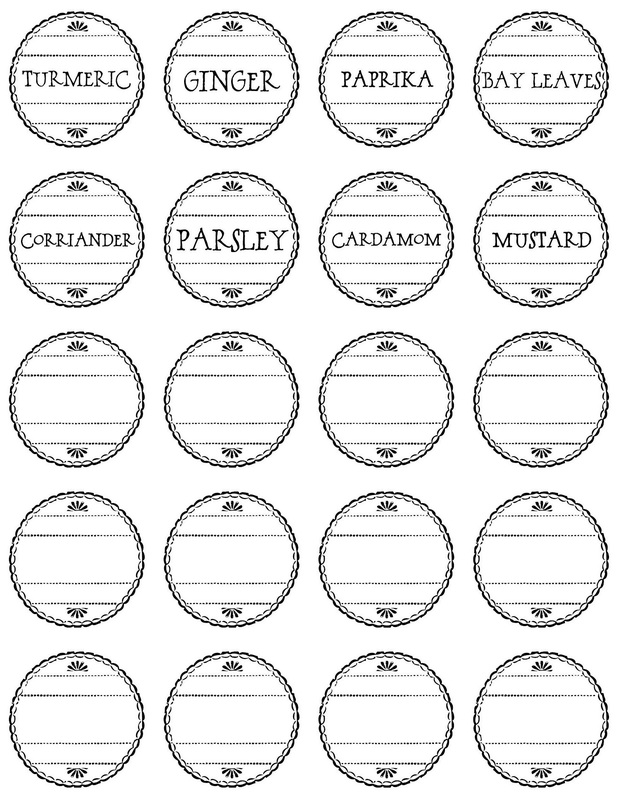 It actually makes me want to make some gorgeous-looking labels, like yours! I love these! Super cute. I have always wanted a really nice way to organize my spices. I have a nice spice rack, but the jar openings are too small to get measuring spoons (even tsp) into, and the names have worn off the jars. I've been trying to figure out how to relabel them. Not sure that this will help as my jars open on top, but it's a great idea! Bonnie, my solution to jars that open on the top was to buy new jars ;-) Some of mine were the plastic ones you buy the spices in, and some were glass from our old spice rack. I hesitated only slightly considering whether I needed the sprinkling holes. But I rarely used them. I love my new jars! 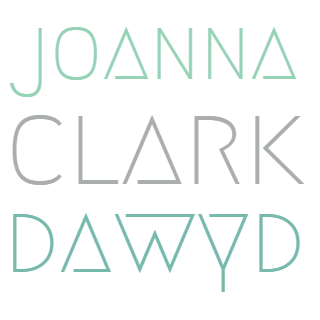 Hi Joanna - what a great idea!! Love the detail on the label and the way that you can see all the spices when you open your cupboard door. My spices are in a variety of jars and containers thrown into a 12" wide cupboard. I think it's time to do something about it, don't you? Heather, I'd love to see the solution you come up with for your spices! Oh I love this idea. Where did you get the jars? The labels are cute. I wish my spices were this easy to find. Hi Jennifer! I got the jars at Ikea. It's a set of 4 for $3.99, I think. I used seven sets. Hello Jennifer, Oh wow, these came out fantastic! Excellent.. Thanks, Russell! And thanks for visiting! Your spice jars look so cute and organized. Great idea. Love 'em! I wish mine looked so nice. They're all different shapes and sizes, kind of quirky. I need to find a label design that will work for such a variety. Revi, I had a variety of sizes, but I replaced them all with the glass ikea jars. LOVE LOVE LOVE!!! And the 2 x 4 is just perfect! Thanks for the link to the labels. I reorganized my spices last January and the labels I used aren't the best. These will look much better! LOVE these labels! I have these jars and my current labels are S.A.D! haha. Looks like I'm gonna be havin a little fun this weekend ;) Thanks for the inspiration!! Wow, great job! It drives me crazy that my spices are in all different sized jars & containers....love this idea! I love these! Thanks so much for sharing. I'm in the middle of a kitchen remodel from hell, and this will give me something to do as we go into our 7th month of waiting! I love this! Where did you get the jars? Hi Misti, thanks for visiting! The jars are from Ikea. Hi! 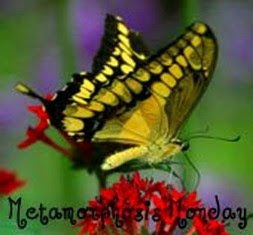 I love these, thank you for sharing :) I was wondering, what font did you use? 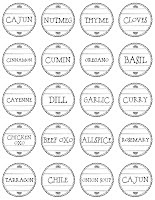 I would love to fill in those blank labels with the spices I'm missing. I might have a solution to your magic marker peeking out... have you tried using rubbing alcohol (at least 70%, but 91% works much faster) and dipping a q-tip in the alcohol to rub on the edges that peek through?? All in all, I will probably use your idea as a gift to my sister, who LOVES using spices and such but has a hodge-podge collection of spices in different jars. 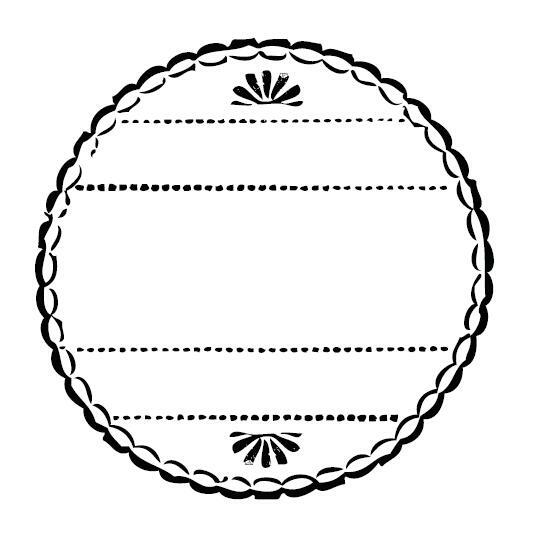 Thought I was computer savvy, want to use the template for the exact one you put on your jars, no idea how. Can you send me directions? Thank you. 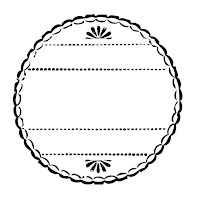 I'd also like to use the template on my IKEA jars. I don't see where you share so I can download it? Can you give directions. Thanks! Love love love this idea. The 2 X 4 boards make it so efficient. I am going to try this. went to the link for these "editable" labels. they say you can change the font, size etc. um...nope. It only lets you use the helvetica (boring for this application) font and only in one size, which happens to be too small. any idea how to remedy this? Nice job! What font did you use?